Clive Brunskill / Getty ImagesRoger Federer got so drunk he couldn’t remember what he did after Wimbledon. Roger Federer got so drunk after winning his 8th Wimbledon Championship title that he was almost at ‘break point’ when he addressed the press on Monday. The 35-year-old beat Marin Čilić in straight sets on Sunday and was up until 5 a.m. making a racket in London’s bars. “My head’s ringing,” Federer said when he resurfaced on Monday, telling media about his night after the Champions’ dinner at Guildhall in London. “I don’t know what I did last night. I drank too many types of drinks, I guess. “After the ball we went to — what would you call it? I guess it’s a bar — and there were almost 30 to 40 friends that were there. We had a great time. 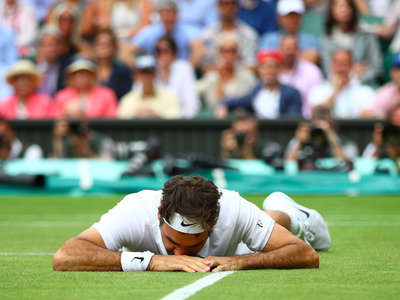 Federer’s win at Wimbledon was his 19th career slam title, four more than closest rival Rafael Nadal. Considering the Swiss maestro won the Australia Open earlier this year he could be fancied to pick up a third slam of the year when he heads to the US Open next month. Federer, though, is hoping the younger stars of tennis are able to challenge him and even offered his rivals advice — get more aggressive. “I look at the stats and, whatever round it is, I see that the guy I’m going to face is playing 2% of serve and volley throughout the Championship. I’m going, ok, I know he’s not going to serve and volley — which is great for me. And the grass was playing fast this week,” he said.